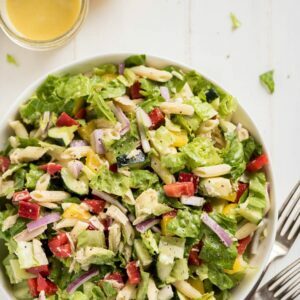 Chopped Tuna Salad is the perfect summer side dish. Filled with fresh crisp veggies the color of the rainbow, protein packed tuna, and tossed in a light and refreshing lemon vinaigrette. Cook pasta according to direction on package. Drain and place in a bowl of ice cold water. Drain again. Place all vegetables in a bowl along with the cooled and drained pasta. Drizzle with dressing and toss. Place vinaigrette ingredients in a food processor or small blender and pulse until smooth.